Black Friday, Cyber Monday and Small Business Saturday are just days away, and the intense weeks of holiday shopping and spending still to come, makes email marketing a must. Our customer email data shows that email send volume increased by 10% from October to November, 2011 – not surprising, considering the major opportunity! 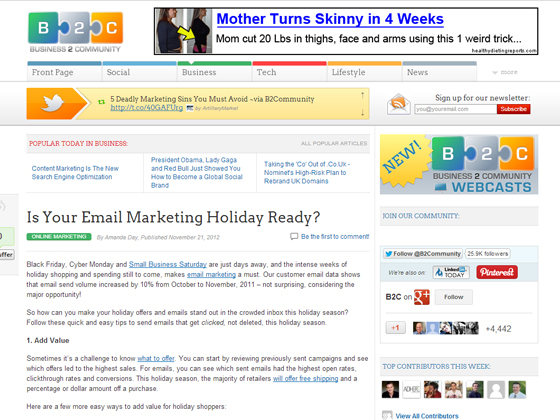 So how can you make your holiday offers and emails stand out in the crowded inbox this holiday season? Follow these quick and easy tips to send emails that get clicked, not deleted, this holiday season. Sometimes it’s a challenge to know what to offer. You can start by reviewing previously sent campaigns and see which offers led to the highest sales. For emails, you can see which sent emails had the highest open rates, clickthrough rates and conversions. This holiday season, the majority of retailers will offer free shipping and a percentage or dollar amount off a purchase. Consider offering free or expedited shipping to help out your last-minute shoppers (there are plenty!). Offer a first-time customer or refer-a-friend discount for existing customers. Add an expiration date to your offer to create a sense of urgency.